Let’s skip the small talk, you’ve waited for far too long. These are the super exercise that’ll work fast and hard on those stubborn fats. Lunging is a high-intensity exercise and it is capable to burn a lot of calories. Depending on your size and a lot of other factors of calories burning, one can approximately lose 275 calories just within 30 minutes of lunges. Though there are many types of lunges, they’ll be very effective for weight loss regardless which you choose to insert into your routine. In fact, it is the most important lower-body exercise. Making multiple lower-body muscles work at once may not only facilitate with weight loss, but it’ll also increase your strength and leg aesthetic. Another intense exercise that is sure to torch away calories would be the burpees. As a full body exercise, it targets both the lower or upper body and as research shows this in return burn more 50% fat than moderate exercising. Not only that, burpees help build your strength and endurance too. So the next time you’re exercising, remember this mantra: It’s almost become a sin if you left out burpees from your weight loss exercise routine. Perfect timing to revisit our favorite childhood sports activities. Did you know that you can burn 200 calories in a two 10-minute sessions? That is much more calories burned compared to spending the same amount of time on the treadmill. Imagine doing that for a week, you could lose 1000 calories! In case you didn’t know, jump rope has become the staples of the VS angels exercises and they’ve pretty much master every trick there is on jumping rope. Bet you thought they were frail, didn’t you? 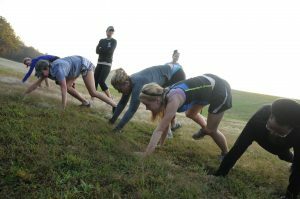 The statement ‘better than burpees in burning calories’ should already rope you into doing the crawls. 100 calories burnt per 10 minutes seems like a good bargain, but don’t let those numbers fool you; Bear Claws exercise is so much more than that. Not just burning an enormous amount of calories, when done properly, it also strengthens arms, chest, shoulders, and core. Now that’s a bargain. Tips: Combine bear crawls with lunges for maximum calories burned and see how improved your lunges will be. Admittedly a little bit hard to execute, not because of the running but because of the sandy situation, obviously. When it becomes available to you, be it sand dunes or the beach try running or jogging on them. Sand running burns 30%more calories when compared to flat surface running because it forces you to use more energy in order to move forward. If it is safe enough (no visible shards and minimal sharp rocks), try barefoot running. That will stretch and strengthen your Achilles tendon and calf muscle which may reduce injuries in the future.